.......those who create and feel the way you do. 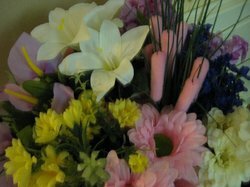 I was determined to create a little something with those pretty spring flowers, here's a little peek at what I put together. OK...these aren't "Real" flowers, but they were so beautiful. I couldn't pass them by. I might not be able to smell them. I found this poem this morning.....thought I would Share. Saturday was rainy, icy and cold cold cold!!!! But my friend Corrine and I went in search of treasures and bargains as if it were a beautiful spring day.Once we started.....talking...laughing and brainstorming we seemed to forget all about the dreadful weather that was around us. 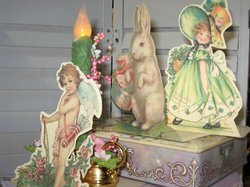 We did discover some great finds, sweet little robin eggs, a darling tin vintage rabbit compass (LOVE IT) , and a precious set of lambs. 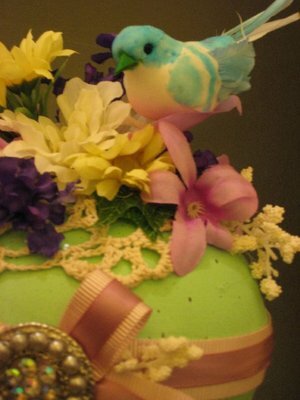 The shops we visited really inspired us with their new Easter and spring items. 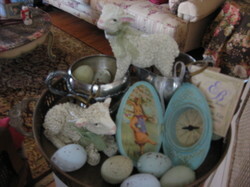 These new finds will breath new life into my existing Easter decorations. Outside maybe cold, but inside will look and feel like sunshine. I am soooo ready. 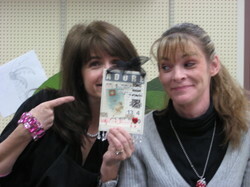 This is my Kindred Spirit: My Co-worker and FRIEND.....Corrine! She is why my blog is Kindred Spirit...because of her I am excited about designing and creating again. She inspires me on a daily basics with her talented ideas and her never ending motivational talks. Being my Kindred Spirit you would think we would be just alike ....not so...she has more patience than anyone I know and she is the best listener on earth. I'm trying harder, really. Our friend Robin...would totally agree! On Valentine's Day she surprised myself and all of our co-workers with this darling handmade Valentine. It is soooooo CUTE!!! Love It....Such a thoughtful thing to do. Thank you, Corrine for everything! Good morning and Happy Valentine's Day to All. May all your Wishes come true on Valentine's Day! 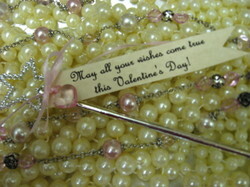 reads: "May All Your Wishes Come True On Valentine's Day". a wand and their Valentine's Day would be the best ever! It's good to be back at the Heart! Last weekend was so much fun. I didn't realize how much I had missed being at the An Affair of the Heart Show. I saw so many people from years passed...it was good to catch up with all. It was nice to receive such positive feedback on the new kits. Thank you and I hope you enjoy what's coming your way..... 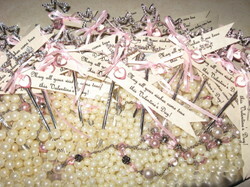 I have started listing the kits at my new online Etsy Store .......mykindredspirits.etsy.com...I hope you'll visit when you can. 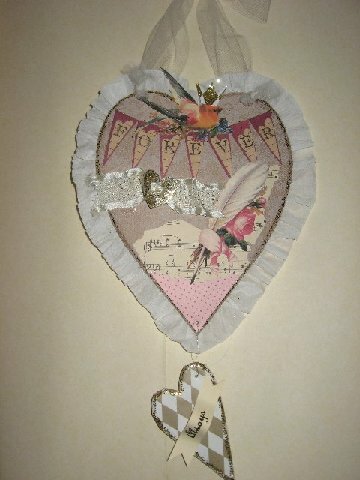 One of the New Craft Kits Showing at An Affair of The Heart! !